Have you ever felt something go bump in the night? Did R.L. Stein give you “Goosebumps”? But Halloween does conjure up images of ghosts, which naturally begs the question — do ghosts exist? And where might they exist in Calgary? 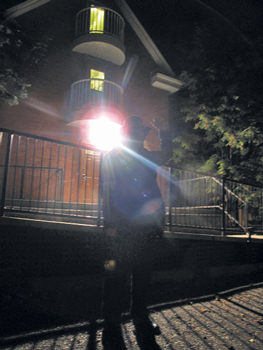 Tour company Calgary Ghost Tours, run by Johanna Lane, will take you on a journey to the most haunted local sites until Oct. 31. Lane’s knowledge of Calgary’s history is no trick. She is well researched on the city’s ominous past. Tales of murders and mishaps filled the Inglewood tour with excitement and intrigue. It was said on the tour that many “ghosts” survive in certain old buildings. For instance, the Deane House in Inglewood is likely the most infamous, along with the Prince House in Heritage Park. Site staff have told many of the same stories of flickering lights, running faucets and slamming windows for no apparent reason. Lurking around Inglewood in the dark, Lane shares many spooky tales. She describes how the Cross House (currently Rouge Restaurant) is riddled with ghosts. Neighbours have reportedly “seen” Mrs. Helen Cross sitting in the window. As the story goes, she would watch for her husband Alfred Ernest (A.E.) Cross to come home every night from the brewery he owned, the Calgary Brewing and Malt Company, and she would have tea ready upon his arrival. After losing two of her children to illness she swore to never live in the house again. Just down the street, where the bridge goes over to the Calgary Zoo, it’s said a boy was murdered many years ago. According to the story, a man led the boy underneath the bridge where he brutally stabbed him to death. The boy’s spirit is said to still be under the bridge and some have heard him screaming. Once captured, the murderer said it was the evils of the Deane house that made him do it. Calgary’s Deane House seems a hotbed for tragic deaths and killings. Richard Deane, who was captain of Fort Calgary, had his home built by convicts from the Fort, that seems like a bad idea to start. His first wife died and has since allegedly been seen in the third-floor window on several occasions. Deane house staff has reportedly had experiences with things moving or faucets all turning on at the same time. “As far as I can see, its (strange events) are unexplainable,” Lane said. With ghosts you think nighttime, but in the light of day is when the most ghosts have been spotted, according to Lane. “I’m still waiting for a full apparition,” she said. Lane may be waiting for some time, or maybe her mind isn’t playing tricks on her as it may for others. “The mind is trying to make meaning all the time,” said psychologist David Cann at Mount Royal University. In situations where the mind wants to see something, he said it very well may. “If that’s what they expect to experience then the mind is looking for evidence to confirm that hypothesis,” Cann said. So if you are out stalking spirits in the night this Hallow’s Eve, be sure to look closely. That figure you just saw may not be Rosemary’s baby, but your mind playing tricks on you.